Animal rights activists in the United States, China, and many other countries around the world are crestfallen this week as the Yulin Dog Meat Festival kicks off in rural southern China. Although smaller than in previous years, the festival ( which also exists to celebrate lychee fruit and the summer solstice) centers around a gruesome main attraction. Thousands of dogs are brutally beaten, burned, skinned—typically while still alive, and while their abusers are smiling—and then eventually eaten. Since it began in 2010, the festival has drawn attention from around the globe, as animal lovers fight to end the cruel event. Warning: the above video contains graphic footage of violence against animals. This week, the 6th annual festival began as scheduled, despite global protests. Celebrities such as Joaquin Phoenix, Matt Damon, and Russell Simmons banded together to film a public service announcement produced by the nonprofit Animal Hope and Wellness Foundation, making tearful pleas to end the slaughter. This is just one example of the many ways animal lovers around the globe have been working to protect China’s dogs. Earlier this month, the Humane Society International (HSI) with a local group called Beijing Mothers Against Animal Cruelty presented a petition to Yulin and Chinese government officials containing 11 million signatures. So far, the government has taken little to no action. The dogs tortured at the Yulin Dog Meat Festival are collected by traders, often by dishonest means. 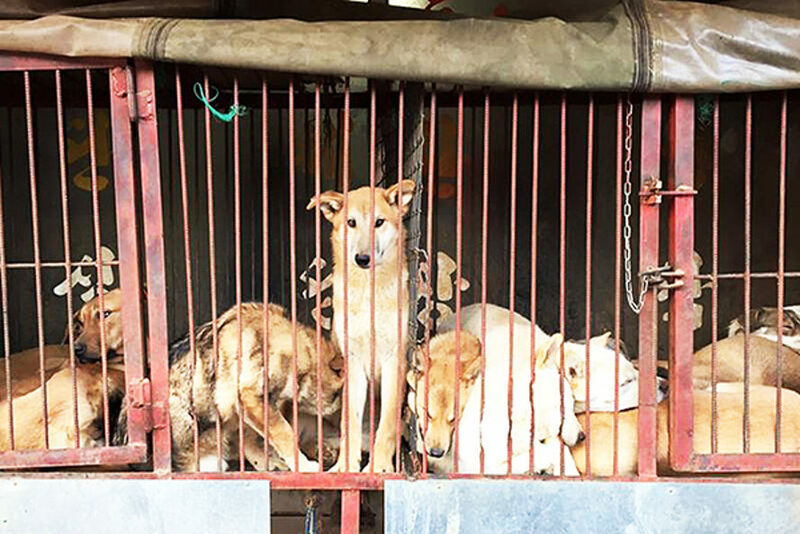 A few months ago, an undercover video taken at a Yulin slaughterhouse showed cages packed full of dogs and many of the animals were wearing collars and tags, suggesting that they had been housepets, most likely stolen off the street. The festival has no specialties or restrictions for the age or type of dog involved in the torture, so even very young puppies may be brutally beaten this week and the breeds can include recognizable purebreds like cocker spaniels and labradors. Some of the dogs destined to be killed at this week’s festival were rescued in the nick of time, but the numbers are small. 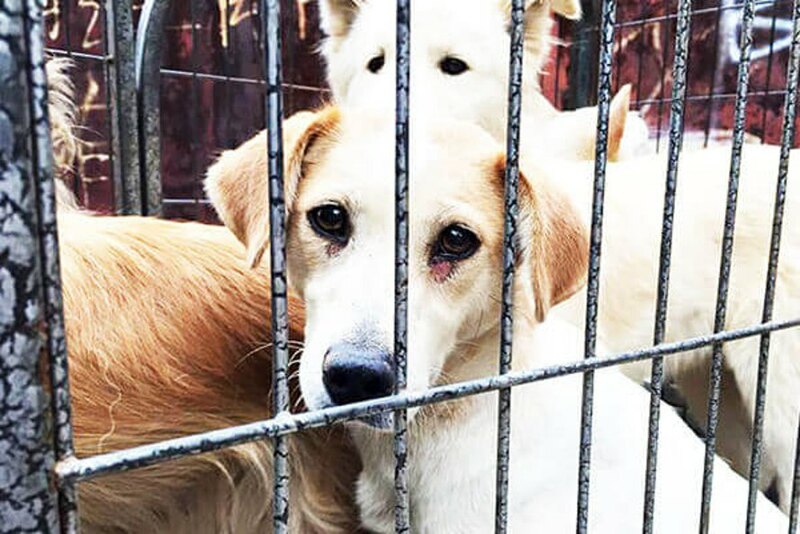 Various sources have reported that a handful of groups of dogs, ranging from 15 to 20 individuals, were rescued just days prior to the festival’s opening, and HSI has transported 54 dogs and cats to local shelters in China after they were saved from traders. HSI also reports that this year’s festival is likely to be much smaller than in years past, as political pressure may be reducing participation. In its inaugural year, the Yulin festival slaughtered as many as 15,000 dogs. HSI says the number dropped to 2,000-3,000 dogs in 2015, and the agency’s team in China says there is evidence pointing to less killing than in previous years. There should be a huge competing festival held by activists as close as possible to this festival next time, celebrating peace, love and human respect for other animals! Now in its sixth year, the annual Yulin Dog Meat Festival is still being held in rural southern China, where thousands of dogs are tortured and killed within just a few days.